Has Spring sprung in your corner of the world? We’ve seen glimpses of it here and there, and then it creeps back to more of a wintery mood with chilly winds and bits of rain and snow. At the warmest part of my flower beds I noticed that tulips are just peeking their tips out, but I think they should stay in the ground a little longer till all the snow melts! I have a sweet breath of spring today with this lovely Power Poppy Digital image called Graceful Still Life. I printed the image quite large but softened the colour so that I could keep the colouring more pale too. I love the look of pink dogwood, so that’s how I coloured it up with Copics, then I did some out of the box cutting and tucked the stitched die in underneath so that the blooms could stick up and the die cut the rest of the rectangle below. I paired it all with a sentiment from Power Poppy’s new set, Burst of Kindness in Memento Pear Tart Ink, and then some pretty green and pink papers, and a bright green baker’s twine bow. 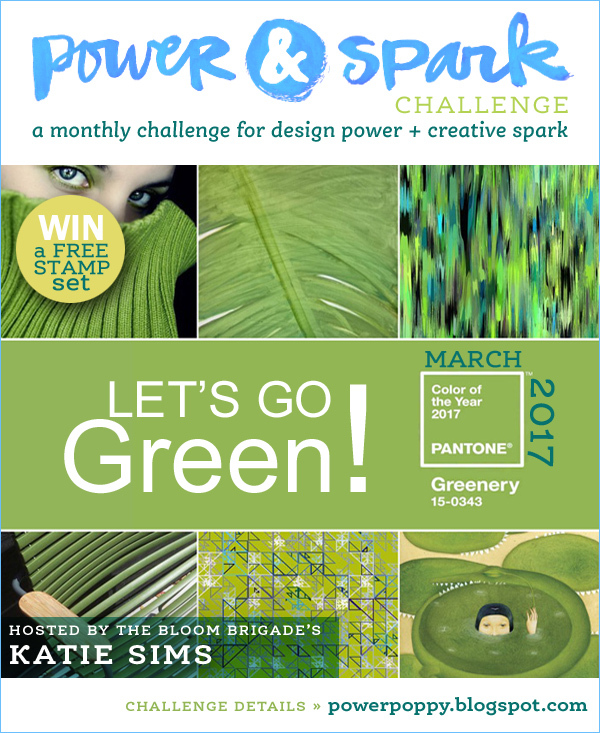 That way I could play along again with our Power & Spark Challenge to Go Green! 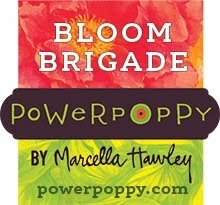 There’s just one week left in the challenge and you could win a Power Poppy set of your choice...with 8 new sets to choose from it’s great incentive! Here’s my Bloom Brigade sisterhood playing along today....thanks for popping by! Absolutely lovely Christine! I love the bold pink with the soft green. The blooms just pop and give this card such a happy feel. One can't help but smile when they gaze upon this beauty!! Christine, it's wonderful that you are seeing spring coming soon and the flowers are beginning to peek out at you! 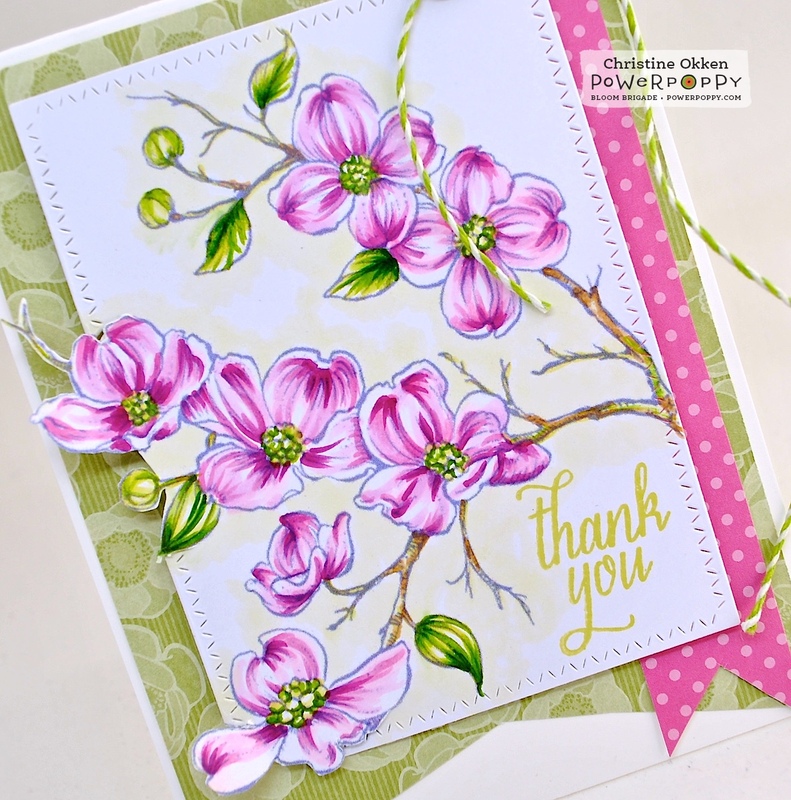 I absolutely love your card with this lovely branch of dogwood, and I too love the pink ones. Beautifully colored and with a great layout and that wonderful new green for the year! Hugs! Wow your coloring in this is fabulous, love it all!! Beautifully done, I love the way you cut out the flowers from the framing! 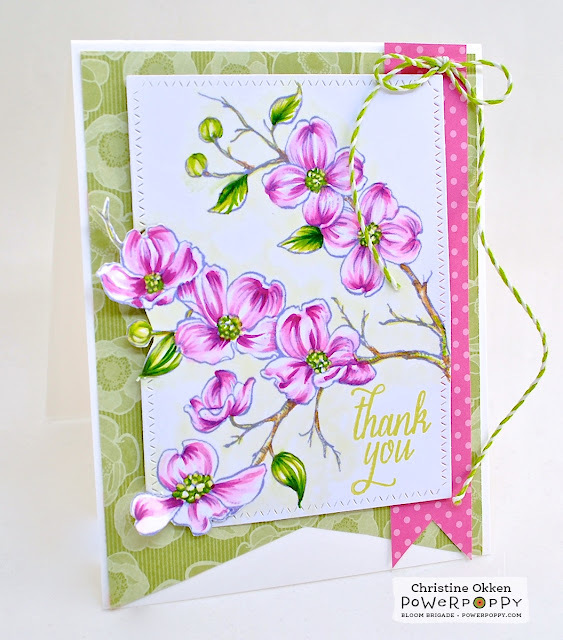 Hello Christine, this is a beautiful card,really love your colouring and the dogwood is so beautiful. You are lucky coming into spring, here in New Zealand we are in Autumn (fall). Days are getting shorter, but it's still very warm. My tulip bulbs are chilling in the fridge, and will be ready to plant out in the middle of May. Stunning card. You are a master with the coloring. Beautiful layout and coloring. Woah.... this is stunning Christine. I love the fresh and airy look you created with that fabulous coloring. You can almost smell spring just looking at this card! One of my favorite colour combos. Totally gorgeous dogwoods too! !